BOSTON – Thursday, August 3, 2017 – Mayor Martin J. Walsh today announced the launch of RentSmart Boston, a tool that provides prospective renters and homeowners with data about Boston’s properties. RentSmart Boston is part of Mayor Martin J. Walsh’s commitment to the safety of all Boston renters, as outlined in Housing a Changing City: Boston 2030, the Walsh Administration’s comprehensive housing plan. Students in particular can be at risk for living in unsafe housing, as code violations often go unreported due to high unit turnover among students. RentSmart Boston is a valuable tool for students and families to ensure that they are renting responsibly. 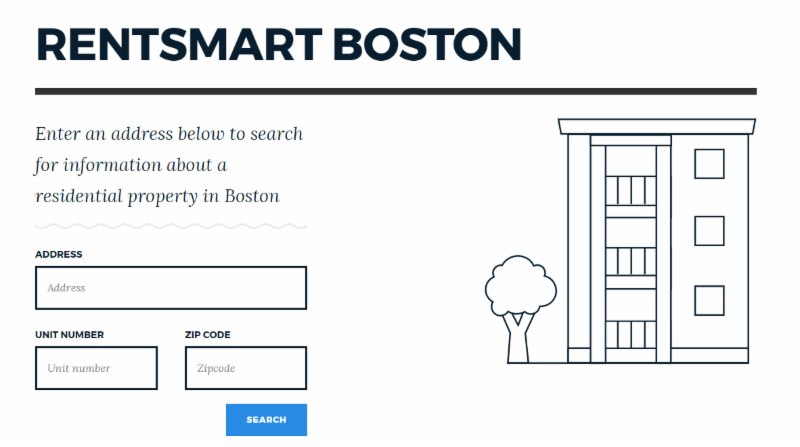 The RentSmart Boston tool is just one way the City is using data to empower its constituents. In April, the Department of Innovation and Technology’s Data and Analytics Team also released Analyze Boston, the City’s open data hub. By the year 2030, Boston will reach more than 700,000 residents, a number the City has not seen since the 1950s. Housing a Changing City: Boston 2030 is the Walsh Administration’s comprehensive housing plan to reach 53,000 new units of housing at a variety of income levels across the City. Imagine Boston 2030 is building on Housing a Changing City by identifying areas where continued growth can occur and where additional growth beyond the 53,000-unit target can take place. This growth will create a release valve for existing neighborhoods that are seeing pressure on housing prices. Other initiatives include: working to increase the overall housing supply, deploying tools to support the preservation of affordable housing citywide, putting forth an anti-displacement package that will create and preserve affordable housing, and preventing eviction, link housing and transportation and supporting homeownership. For more information included in the plan, please visit imagine.boston.gov.